KEW GARDENS, Queens (WABC) -- Mike Ricatto is not a subtle man. You know where he stands before you knock on the door, you know if you're brave enough to knock on the door. So when he was given $1,600 in fines by the Parks Department in Queens, he had no doubt what his crime was. "They don't want anyone to speak out their mind, if it differs what they believe," Ricatto said. Three of Ricatto's Donald Trump campaign signs were stolen from his lawn in Kew Gardens. His surveillance camera's captured a grainy picture of the man who took one of them. 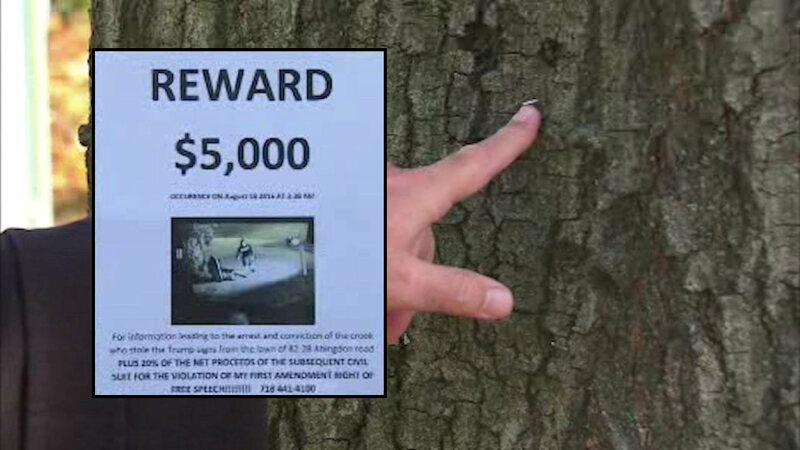 So Ricatto put up flyers on trees in his neighborhood offering a reward. He used staples to fasten the signs to trees. "Weeks and weeks later, I got visited, by some Parks Department personnel and they handed me 22 summonses," Ricatto said. Those summonses come to a total of $1,600. In fact, Parks intended to levy an additional $41,000 in fines against Ricatto, but the officer assigned to deliver the fine refused, saying it was unjust. "The officers that are familiar with this think it is definitely political, even the Forrester who got this thing going said to the officers, 'Stay away, it's political, do not get involved,'" said Geoffrey Croft, a parks advocate. If the Parks Department wanted to hand out a lot of summonses for putting staples on trees, they wouldn't have to look far for guilty parties. When they are doing pruning along this street they put signs up on the trees warning people not to park there. They use staples to put up the signs. The Parks Department issued a statement that says, "Damaging trees is against parks rules. Destroying a tree's protective layers, bark and inner skin, have harmful, long term effects, including death." But an internal memo from the Parks Department's own lawyer says differently, "Our office was told many years ago, that staples do not cause harm to city trees, to the extent that we can seek monetary restitution as they do not penetrate deep enough to cause damage." Ricatto paid the $1,600 because it would have cost much more to fight. "You think it's silenced me, I don't. I won't be silenced," Ricatto said. It sure doesn't look like it.